Basil is native to India, and the Middle East. It can also be found in some Pacific Islands. It most likely came to those islands with the spice traders and eventually made it to the Americas and Australia with early settlers. Basil has been linked with much folklore. It was used as a mixture to ward off witches. It is considered holy to the Greek Orthodox and is used to prepare holy water in churches, and grown in pots around the altars. 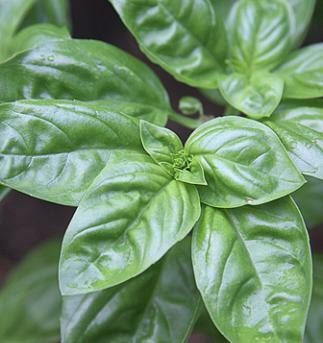 During Elizabethan times, sweet basil was used to clear colds and clear the brain of headaches. It is also linked to love in many cultures. Plant basil indoors 4-6 weeks before last frost, and transplant carefully outdoors after the threat of frost is over. Basil is a tropical plant and does not tolerate cold. It can also be directly sowed in the garden when the last frost is past; however, in colder regions this is not recommended as you will have basil 2 to 4 weeks later than if sown indoors. Basil is relatively easy to grow and is not invasive. It is best planted with peppers and tomatoes because it attracts beneficial insects. Simply keep the soils evenly moist and other than a fall compost, basil shouldn’t need any additional fertilizer unless the plant shows signs of nutrient deficiency. To get a full, busy, basil plant with robust leaves, pinch off the growing tips when they are about 4 to 6 inches (10 to 15 cm) tall. whole plant at the end of the season, and turn all of the leaves into a pesto sauce and freeze. Or just blend up the leaves and freeze to make a thick sauce to use in soups and stews during the winter. the leaves, and crumble to store in a jar in a dark, dry place.